Chaos, anarchy and death. There’s nothing comforting or tranquil in Madame Nightshade’s garden. But what is the cause of all this trouble? How and why has nature turned against us? Beatrice welcomes us to the garden, a comforting, neighbourly invite to begin with. A vine of leaves curls across the back of the stage, across the wall, along the floor. There’s a bin for compost and a rake to one side. A stack of crates looms like an altar. It’s adorned with vegetables. Two large bunches of celery. Some cucumbers and a pair of carrots; yellow squash and a long red chili. A set-up for a market or something altogether deadlier? Beatrice has an alter ego she transforms into. Marie Antoinette with a shocking pink beehive hairdo; this is Madame Nightshade – and she’s here to kill. Soon we understand that the tranquility we’ve observed so far is a mask hiding some terrible truths. Nature has its own defense mechanisms already, but with over-consumption gripping the world and climate change wreaking havoc, she is ready to fight back and Nightshade is the leader of this campaign. While the audience watches, performer Anna Thomson creates a classically grotesque figure through clowning and even as those vegetables become weapons and chaos ensues, we can see there is method to this madness. Nightshade collects cans from various corners of her domain, slowly building a monument to a world that shows less and less concern for nature. Director Sarah Ward and co-director Maude Davey focus Anna’s ideas, bringing a clarity to the seeming chaos. Even as the Twisties and the Mars Bars flew – nature twisted into processed snacks, the message comes through loud and clear: the planet is not happy with us and we shouldn’t be happy with us, either. Madame Nightshade had me laughing or left my mouth hanging open. Anna’s physicality is striking, captivating. This is a performer fully in control of her clowning and her character. The audience interaction is generous and adds to the layers of our complicity; we laugh, even as Nightshade is pelted by waste. A waste we have tried to ignore or bury. This is a smart show; hilarious and thought-provoking. Moments of truly sublime physical theatre, twirling in front of our eyes, as the world falls apart around the Madame and around us. A queer, clowning, feminist triumph. 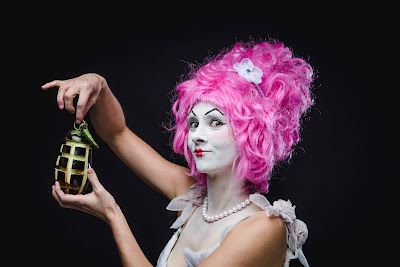 Madame Nightshade’s Poison Garden is on at Gasworks as part of Midsumma until January 26.